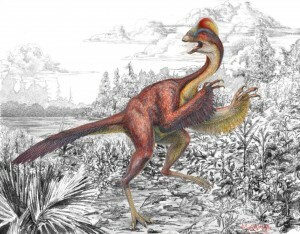 Dinosaur of the Month – Anzu wyliei! 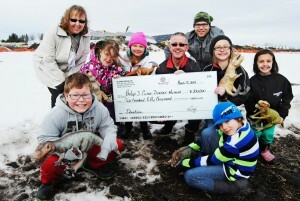 Alliance Pipeline presented the Philip J. Currie Dinosaur Museum with a $250,000 donation yesterday to help fund the museum’s Education Centre. A contingent of Wembley Elementary School Grade Four students was on hand to accept the donation on behalf of all the children who will benefit from the museum’s education programs in the years ahead. The school’s Grade Fours have had a special relationship with the museum project over the last three years as the kids have collected cans and bottles to make an annual donation. The Philip J. Currie Dinosaur museum incorporates all kinds of unique features. One of these features is a circular concrete stairwell that starts in the basement and rises three storeys to the top of the building. Inside of the circular stairwell there is a circular elevator core that the stairwell wraps around. If you look closely at the picture you’ll notice that this circular elevator core is made out of concrete. 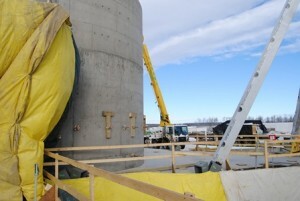 To form this circular concrete core, steel beams were rolled to the required radius and used as the framework to hold together the vertical elements of the formwork. Once this was complete, the inside of the formwork was lined with plywood. This took lots of screws to force and hold the plywood in the curved shape. Ask a Palaeo: how long does it take to put a dinosaur skeleton on display? Once a fossil is found, it can take a long time with many people working on it before it is ready to be put on display. Small fossils can be excavated from the ground in a few days or even a few hours. 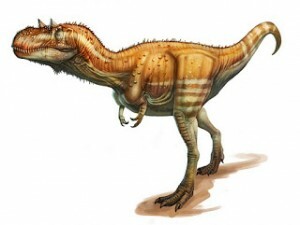 Larger fossils or skeletons that require more care may require a months-long season, or even multiple years going back to the same quarry to extract. 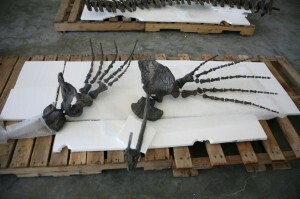 Once the fossil is removed from the ground, it is transported back to a laboratory where it may take as little as a few hours, or as much as several years to clean up and glue back together. This depends largely on the hardness of the rock around the fossil, and how fragile or durable the fossil itself is.